Although never an official signature model, Schecter's PT design owes much of its popularity to The Who's windmilling riff mogul Pete Townshend. Back in 1979, Pete was looking to replace his weighty Gibson Les Paul Deluxe, when his guitar tech, Alan Rogan, presented him with a twin-humbucker, mahogany-bodied T-type built from Schecter repair shop parts. "The model was renamed PT as a cheeky nod to Townshend's initials, and now comes in a huge variety of flavours"
Pete was hooked, and set Schecter and English luthier Roger Giffin to work on some more - you can spot one of Schecter's gold creations at The Who's storming 1985 Live Aid set. 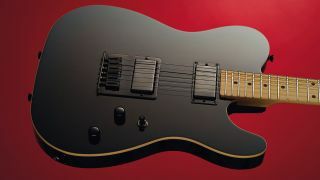 Schecter began mass-producing the first 'PT' model in 1984, initially dubbing it the Saturn. However, after the company was purchased by ESP Guitars founder Hisatake Shibuya, the model was renamed PT as a cheeky nod to Townshend's initials, and now comes in a huge variety of flavours, many of which are available to non-rockstars courtesy of the cut-price Diamond Series. Pete eventually went on to adopt the Fender Eric Clapton Strat as his main squeeze, but the PT serves as a long-standing reminder of his fling with Schecter. Pete Townshend first picks up a Schecter T-style guitar. The Townshend-derived Saturn production model is introduced. Hisatake Shibuya buys Schecter, and the Saturn becomes the PT. Schecter launches the Diamond Series, which features a range of new PT models.